Today, I'm going to give a big ol' thumbs-up to this Drawstring Cosmetic Bag. It comes in a bunch of different colors and patterns, but I got mine in "Lovely Flamingo" to match the outdated vintage vibe of my 1960's bathroom, lol. 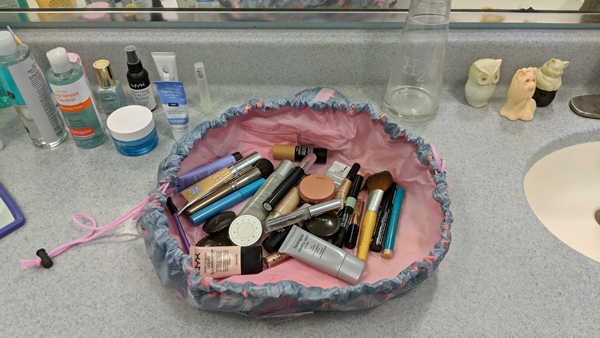 I have tried many things over the years to organize my makeup in a way that I liked, and this $10 thingy is the absolute best. Nothing else has even come close! I get to see everything I need at a glance, and then I get to put it all away neatly in a moment. I LOVE IT. 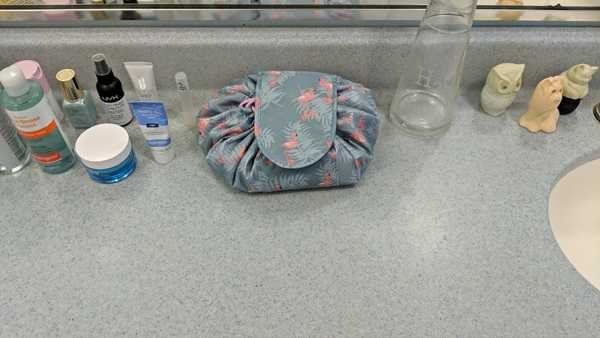 And it has the added bonus of keeping my basic makeup kit pre-packed for anytime I go away somewhere. Such a simple, nifty item. Thumbs way up!